The Carthaginians, and the Phoenicians in general, are renowned for their seafaring abilities. There is evidence for their circumnavigation of Africa, and strong evidence for the fact that Hanno the Navigator reached modern Cameroon. 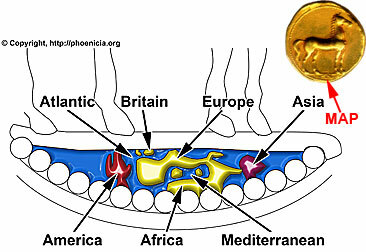 The geologist Mark McMenamin, working with computer-enhanced images of gold coins minted in Carthage between 350 and 320 BC, analyzed a series of misterious designs appearing on these coins, the meaning of which has long puzzled scholars. McMenamin interpreted the designs as a map of the ancient world, including the area surrounding the Mediterranean Sea and the land mass representing the Americas. [...] in the deep off Africa is an island of considerable size...fruitful, much of it mountainous.... Through it flow navigable rivers....The Phoenicians had discovered it by accident after having planted many colonies throughout Africa. We also have another clue. In 1872, four pieces of a stone tablet inscribed with strange characters were found on a Brazilian plantation near the Paraiba River. A copy of the inscription was sent by the owner of the property to Dr. Ladislau Netto, director of the Museu Nacional in Rio de Janeiro. After studying the document carefully, Dr. Netto announced to a startled world that the inscription recorded the arrival of Phoenician mariners in Brazil centuries before Christ. Unfortunately, an Indian rebellion broke out in the Paraiba region that same year and in the ensuing confusion, the plantation in question was never located and the stone itself was never recovered. A copy of the inscription was sent to the eminent French historian and philologist Ernest Renan who declared it a fake, and Netto was ridiculed by the academic establishment of his day. We are sons of Canaan from Sidon...We sailed from Ezion-geber into the Red Sea and voyaged with ten ships. We were at sea together for two years around Africa but were separated by the hand of Baal and we were no longer with our companions. So we have come here, twelve men and three women...may the exalted gods and goddesses favor us. What is the state of the art take on these claims? Despite Gordon’s certainty about the genuineness of the inscription, he failed to find support from colleagues and, notably, entered into a bitter dispute with Frank Moore Cross Jr (born 1921), Hancock Professor of Hebrew and Other Oriental Languages Emeritus at Harvard. Cross pointed to problems with the script, vocabulary and spelling (just about every aspect of the inscription, in fact) demonstrating conclusively that the text was a modern forgery. This seemed to be something of a pass-time among antiquarians in the 19th century. When you see hoofprints, think horses, not zebras. Not the answer you're looking for? Browse other questions tagged ancient-history carthage americas phoenicia precolumbian-contact or ask your own question. Why America was not discovered from the left land at Bering strait? Historical Claims Against Jesus Christ's Existence? Was there a state or kingdom in the Maghreb of North Africa that predates the founding of Carthage?